Julia & Julia may have gotten trounced by G.I. Joe almost three to one at the box office, but one side effect of the film and its media frenzy is a massive renewed interest in cookbooks by Julia Child. 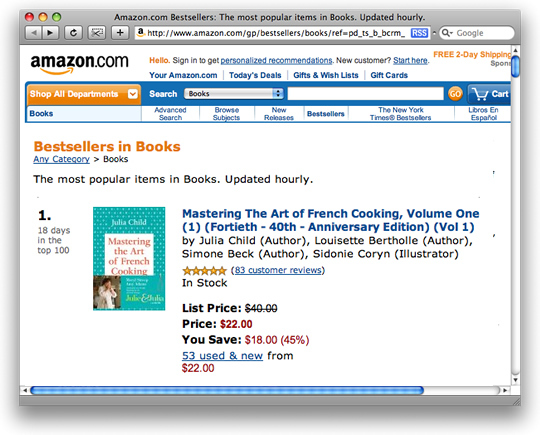 Mastering the Art of French Cooking, Volume 1 (buy at Amazon ) is currently Amazon's overall number one bestseller (her memoir My Life in France is #10 overall). Julia Child's books also occupy six of the top eight slots in the cooking category (the other two slots belong to Julie Powell's Julie and Julia). 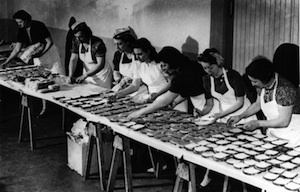 Mastering the Art of French Cooking may be a 48 year-old cookbook (released in 1961), but according to Paul Bogaards, director of publicity at Alfred A. Knopf, sales are up "300% so far this year over all of last year." And Mastering was not published without difficulty: Judith Jones, Child's editor and confidante, in the introductory essay "The Story of 'Mastering' at Knopf" in the 40th Anniversary Edition, recalled, "Alfred Knopf, when I told him the title we had settled on, said if anyone would buy a book by that title, he would eat his hat." In her review of the film Julia & Julia here at EMD, Helen Rosner made the case that the real star is Mastering the Art of French Cooking: "the thing that ties these two women's lives together is the story of the book, how it came to be and what it wound up doing with itself." And while reviews of the the film Julie & Julia may be mixed, it's impressive that although there's a resurgence of interest in Julia Child herself, it's not the memoir that's the #1 seller, but instead it's the cookbook. Judith Jones had a feeling about it when she told Publishers Weekly: "I think the film will have a real impact, particularly on young people. It’s almost palpable, the feeling in the audience. Mastering the Art of French Cooking is going to be back in everyone’s kitchen again, I hope." Judged by the Amazon sales, it's definitely happening. It's reassuring to imagine legions of people new to Mastering, inspired, (re)discovering classic French dishes, and making a coq au vin or a bœuf bourguignon. And béarnaise sauce and potage parmentier and pommes souffles and chocolate mousse and the entire enduring culinary legacy of France, that's so thoroughly and gracefully documented by Julia Child. Maybe we'll even see aspics make a comeback!